The principle of Natural farming is NOTHING FROM OUTSIDE OF YOUR LAND IS REQUIRED TO GROW WHAT YOU WANT. Everything should create in the land itself i.e. our intervention is to the extent of maintaining appropriate biomass along with atmosphere in the land. Remaining everything is available in this nature which has got many more than the above mentioned. Money should flow towards you and you should not purchase anything from outside to produce agricultural products in natural farming. While this is the ultimate goal in Natural farming, in the early process of soil building I think that using mulching material (rice straw,leaves etc)and organic matter from outside sources is a way of kickstarting the process.Even the “father of natural farming” used chicken droppings from a neighbouring poultry farm to scatter in his fields. Once your land is growing enough matter for mulching and green manure you can stop using outside sources and be self sufficient. I dont think you read my post well!! See the size of fruit grown through natural farming. Any update in subject matter? 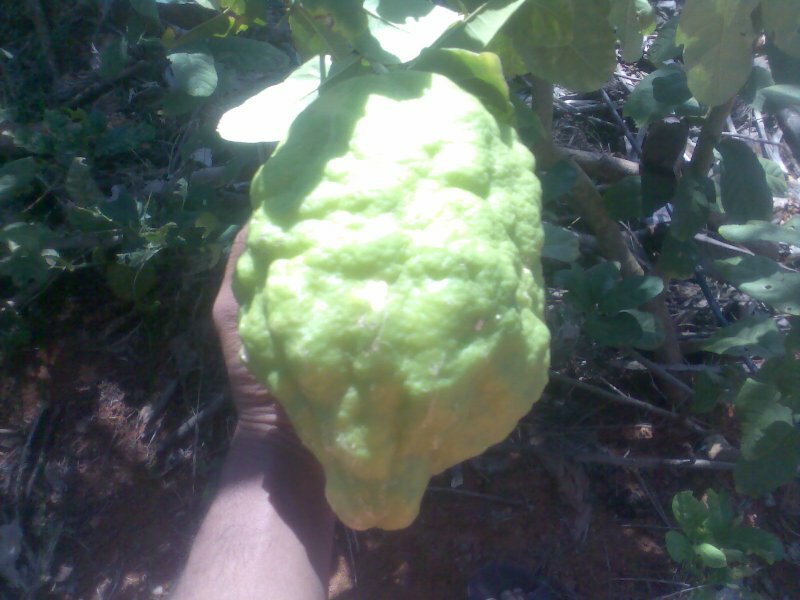 The fruit in the pic, its size is natural. I have seen in my backyard some growing still bigger than this. I think it has got nothing to do with organic or inorganic. In kannada its called Madhaphala or Madavala. a type of citrus fruit, rind is sour and other part, little sweet. Not a commercial crop. Right ? Before starting organic farming,We should ensure that the soil is not sick.Soil should be enriched by using Organic manures like Panchagavya,Vermicompost etc andsoil health should be regained.Then start organic farming.Never use chemicals,pesticides,chemical fertilizers etc.slowly the nature will start show its magic.You should have greate patience also. You are getting more than 5% from the energy of the Sun. That is why a natural farm is filled with different plants, which tap the energy of sun and convert it to the food they need. The food made by each plant is different and when their leaves and twigs fall down and decompose, all plants receive their necessary nutrients. I would like to start a Natural Farm, dedicate atleast 1 acre of land for natural farming. I think the first thing i need to do is to start with cover crop. Any experts who could advice me on this?. Wishing you great ahead in getting your healthy agriculture produce through Natural Farming. You can start with all the grops including main crop, host crop, cover crop what ever it may be. But ensure perfect combination of crops to avoid competition between the crops. More over perfect layout for harvesting sunlight and water. Thanks Swamy for the wishes. Always, there is a endless debate on nature vs, nurture. Let me first know what do these mean? Natural: Things and beings in its origional form and quantity to which an inharent sense or right and wrong exist. Natural to us: Things & beings to which we have inharent sense of right and wrong. Organic, natural and unnatural farming are big issues. Animals needs organic componds (carbs, fats, protiens) are absorbed in their molecular form and many of these can’t be synthesized by body but I think all organic nutrients can be synthesized by plants. Hence this difference can be important to keep in mind in organic vs. Inorganic issue. As such, whether Hydroponics is natural or unnatural, organic or inorganic…in need to be evalued in right sense. One more issue is there whether organic/natural farming is practical. In view of nature balances inself and 1:1 consideration, how unnatural imbalances created by us will be adjusted/balanced? Natural farming is real meaning is that do the farm works in natural way. Natural farming is a sustainable farming. Actually natural farming makes the all inputs from resources. Natural Farming cures the soil slashed by herbicide, chemicals & machines. In natural farming does not use pesticide. Pesticides do not only kill insects. Actually they are residing in the soil as well as fruit. That harmful for our body. only theory is found here. what about the practical things? does any one has the practical of this over a period of five years or more. how many have lived in an area with natural facilities. only such a person can think of natural farming. he is doing and not talking. On a lighter note… probably all those who live(d) there does not have farm-nest subscription. There are quite few people living this even now, you may want to travel around coastal Karnataka and some western ghats area to find these people. I am sure, there are many other places too. Talking about organic farming, we ( my home and our neighboring farmers) practice organic farming. Please note, this is not started now, and that is the way of life there, they follow one the ways where lots of things are integrated into living/farming . There are some places where this is well suited, like Uttara Kannda, where i come from, we have this natural settings. For example in my village, we are at the foot of a small mountain ( or should i call it a hill ?). If there is 1 acre of paddy field, you will also find around 1 or 2 acres of commercial crop like acreca/coconut, around 4-5 acres of Forrest and around 4-5 acres of dry land where dry fodder and come cash crop like cashew is grown. Invariably you will find all houses having cattle. Most of us get natural spring water flowing down the hill. None of the the wells are deeper than 13-15 feet. When you see the above setup, everything is integrated. We have cattle, that is used for farming and milk. Compost is produced locally, water is flowing naturally, have to certain forest for farm inputs and fodder for cattle. Recent developments only use, well and water pumps, but rest of things remain in certain ratio, so its manageable. Does this mean that we can practice organic farming only in those areas? Certainly not. We should be able to do the same in any place. Now, we understand the plants and soil better, we know when and in what form water needs to be used. So, just applying the principles we should be able to do it anywhere. We are able to grow vegetables organically on the terrace, why not at the farm itself. There would be certain practical problems, i am sure there are practical solutions too. I am sure if you come up with the real problem, people can provide solutions too. ps: if you wish to see certain places without modern setup, we can plan to visit, it would be nice forest walk and a track too. Natural/Organic farming is very much possible in any part of the world. In my native (near Sabarimala, Kerala), the main crop grown is rubber and I can proudly say that 99% of the farmers follow organic farming. The main fertilizer used is cow dung and extensive cover crop of velvet beans (to them this is almost like an unavoidable aspect). Natural composting is also part of this system. i.e all farm residues are left in the farm to rot and compost by means of natures power. The only “chemical” that I have seen them use is Bordeaux mix before the monsoon season to prevent rotting of the skin/main trunk where tapping is done. Integrated farming is the key. Animals (cow, goat, pig…), birds (chicken, ducks, turkey…) are integral part of this kind of farming. Animals/Birds being part of the farm makes it easier. i.e one doesn’t need to depend of external inputs. In earlier days (I would say in my childhood) many houses didn’t have electricity and other basic amenities (even our ancestral house). My family practiced organic farming then. Now ofcourse, there is electricity, tv, fridge etc but they still practice the same farming system. I guess the organic/natural system of farming can be practiced irrespective of where you are and what you have. All it takes is common sense and ability to understand the implications of using these poisonous pesticides and what harm it can do to ones body. Let’s leave this world a better place for our children to live. That is what Farming community should understand for their better feature. If our ancestors used these chemicals and fertilizers, than we would have born with deadly deceases. If we use, than our next generations will face the problem created by the present people. HD/UHD & other concepts are like filling 10 people in 10X12 sized room, this concept is not to give any opportunity for any other thing than what grower wanted. Bio diversity is principle for our Nature, food, crop etc, thats why we will not eat only rice or wheat, but take vegetables, chilly, salt and tamarind for basic taste and importantly for maintaining good health in our body. All these ingredients ensure to digest the food we taken and enhance immunity in our body. What about mother earth’s health? Her dearest child Agriculturist has to take care of their mother. Hope none of Agriculturist kill their own mother earth on their own hands. After all it his feature is within his hands.